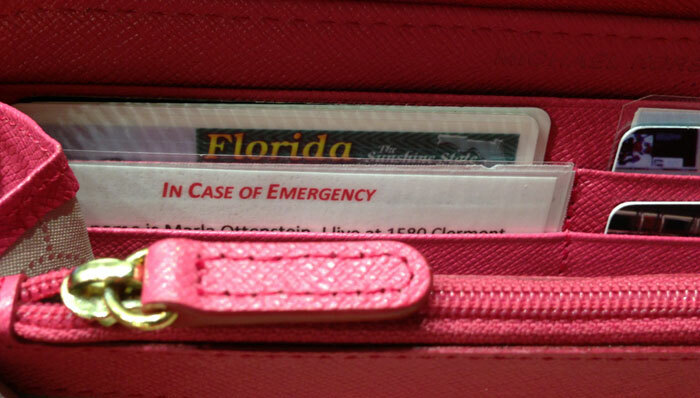 A few years ago when I suggested a friend of mine have an In Case of Emergency Card (ICE Card), she gawked at my suggestion, exclaiming, “I’m not single and I’m not old, why would I need one? Sadly, this person, who is in the habit of driving with her apricot-colored poodle sitting in her lap, while applying mascara with one hand, texting with the other and maneuvering the wheel with her knees is, quite literally, an accident waiting to happen. And yes, she should have an ICE Card. This does not mean entering the name and contact number of a close friend or relative into your Smartphone; this means taking the time to write down the pertinent information; put it in your wallet and carry it with you at all times. Storing emergency contact information in your Smartphone is NOT the answer! What happens if your battery dies or if there’s no cellular connection or if you left your phone at home? And have you thought about what happens if your phone is password-protected and no one knows the password? Or, God forbid, you’re in a car accident and your phone is mangled or lost? I have an Advanced Medical Directive: Provide name of lawyer and all contact information. If you have a “do not resuscitate” directive, ask your lawyer for a wallet-sized card to carry with you. If you live in an apartment or condominium, make sure the property manager or superintendent has a copy of this information on file, as well as a key to your home in case of emergency. To help you with the task of preparing your own ICE card, here is an easy-to-use template for you to printout and complete. Trust me, all of the required information will fit! Remember, there’s only one thing worse than not having an ICE card and that’s having one, which is riddled with errors and incorrect information. Before printing and laminating your I.C.E. Card, be sure to triple-check everything to ensure accuracy. In addition to carrying an ICE Card, be sure to carry current copies of your health and supplemental health insurance cards in your wallet. Finally, if you’re one of those people who figures someone else is driving, so why bother carrying any identification, do you want me to recite the statistics of how many John and Jane Does lie in the morgue or hospital emergency rooms? Be smart and be safe!